The documents, studies, abstracts and scientific papers on the project OPTIME. Poster - "New Time Services in PIONIER Network"
Abstract, Poster - "OPTIME - the system grows - a new 330 km line"
Third International VLBI Technology Workshop in Groningen/Dwingeloo, the Netherlands, 10 - 13 November 2014. Poster - "OPTIME – time and frequency dissemination system based on fiber optical network"
EFTF 2014 Symposioum in Neuchâtel, Switzerland, 23-26 June 2014. 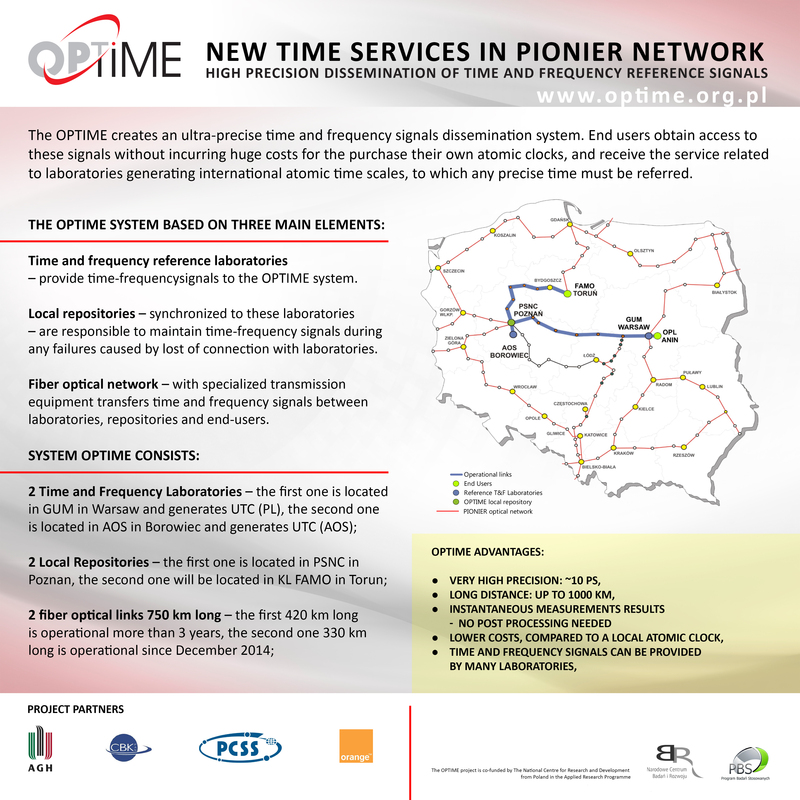 Abstract, Poster - "OPTIME – time and frequency dissemination system based on fiber optical network – local repository project"
KSTiT 2013 in Gdańsk, Poland, 4 - 6 September 2013. EFTF 2013 Symposioum in Prague, Czech Republic, 22 - 25 July 2013. Abstract 1, Poster 1 - "OPTIME – time and frequency dissemination system based on fiber optical network – PIONIER"
Abstract 2, Poster 2 - "Managment and monitoring layer of optical network for time and frequency transfer"
TNC2013 Conference in Maastricht, Netherland, 3 - 6 June 2013.